The Skinny: Director Wilson Yip's costume action-comedy is a light affair, but also a moderately enjoyable one. Cecilia Cheung and Francis Ng turn in good performances, and manage to make the romance angle more engaging than it probably should be. Given its unheralded status, The White Dragon is a welcome little surprise. The odd couple of Cecilia Cheung and Francis Ng lock horns and hearts in director-writer Wilson Yip's unheralded action-comedy The White Dragon. Cheung is Phoenix, a gorgeous student who's all too aware of her own drop-dead good looks. While running with her pack of chatty school pals, she declares that Second Prince Tian Yang (Andy On) is the only man worthy of being her lover. She gets to woo her dream guy when he attends her music recital, an anachronistic performance with Cheung as a solo Six Girl Band, complete with a rotating complement of instruments and a Nicholas Tse-like finale where she smashes her guitar. Tian Yang is immediately smittenwhich is no surprise since it's Cecilia Cheung's exquisite visage making eyes at himand before you know it the two are rollerblading around the palace and engaging in tennis matches. Right away, you can tell that this is not a movie to be taken seriously. 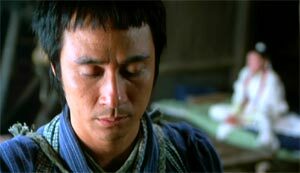 However, there's killing, namely from famed assassin Chicken Feathers (Francis Ng), a blind swordsman who announces his presence with sudden flurries ofyou guessed itchicken feathers. Thanks to convenient exposition, it's revealed that Chicken Feathers only kills people who deserve it. However, one of Chicken Feather's assignments gets him a run-in with the White Dragon, a masked superheroine who gets soundly trashed by her sight-impaired foe. Luckily she's able to transfer her power to the closest person: Phoenix, who subsequently takes up the mantle of the White Dragon. The reason: to get rid of her acne. You see, her new powers muck up her skin, but helping people gives her a good feeling, which should stimulate blood flow and zap her zits, thereby averting disaster at her upcoming date with Tian Yang. Again, this is not a movie to be taken seriously. Not that The White Dragon begs to be taken seriously. Aside from obvious anachronisms (a reference to McDonald's seals the deal on that one), The White Dragon also features over-the-top nineties-style swordplay from action choreographer Ma Yuk-Sing, and an entirely too quirky performance from Francis Ng. 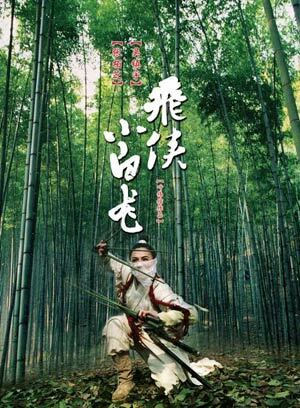 The talented actor plays Chicken Feathers as a blend of Takeshi Kitano's Zatoichi and an Adam Sandler character, a combo that sounds like instant death on paper. Surprisingly, it isn't; Ng shows subtle charisma as Chicken Feathers, and makes a charming lovelorn dope. His character falls for Phoenix/White Dragon when she breaks a limb and he nurses her back to health. 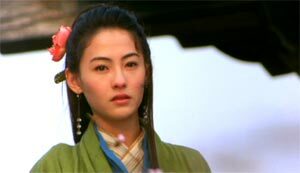 The extended sequence where Phoenix is trapped with Chicken Feathers could bore some people, as its little more than Francis Ng and Cecilia Cheung hanging around together. Still, these are two of Hong Kong's more facile actors, and given their roles here (Cecilia Cheung as a gradually-softening material girl, and Francis Ng as a quirky jiang hu hero), the two manage to make things work. In the hands of lesser actors, the scenes could potentially bore or annoy, but these are not lesser actors. The offbeat pairing of Ng and Cheung makes The White Dragon a welcome, though paper-thin amusement, especially since the rest of the film is completely inconsequential. Wilson Yip concocts a fairly simple and even cloying costume action-comedy, with many minor gags that are more giggles than all-out laughs. The action is confined to small, short sequences that are competently choreographed, but lacking in anything resembling power or excitement. To compensate, Yip adds egregious sound design that dresses up the usual swordplay clangs and swooshes with turbocharged, videogame-like sound effects. Still, the result is ultimately more distracting than exciting, and could easily have been done away with. If Yip was trying to make the martial arts sequences play better, he could simply have made them more interesting. Even more, the big drama of The White Dragon is not who's going to kill who, or who's the best swordsman in the landit's who will the get the girl. The White Dragon pushes romance instead of action as the film's primary drama, which will probably turn off anybody who checks out the film's poster and thinks its going to be House of Flying Daggers redux. True, HOFD also had a central love storyline, but it mixed in tragedy and overdone romantic histrionics with its flying martial arts mania. The White Dragon has only sporadic flying martial arts, low key romance, and comparatively little overdone histrionics. Your standard urban romantic comedy may have more edge than this ultra-light exercise in commercial filmmaking.